If you’ve ever wondered how to harvest pumpkins, follow these simple tips and you will get the most out of your lovely pumpkin crop. After all your hard work growing a beautiful pumpkin crop, you will want to harvest and store them correctly to get the most out of them. A few weeks before harvesting time, it’s a good idea to cut back growing tips and remove any small pumpkins that won’t be big enough before the cold weather starts. That way, all the plant’s energies will be put into the maturing fruits for the last days before harvest. Pumpkins are ready to harvest when the vine dies back and they have deepened to their mature orange color. Although they must be harvested before the first frost, it is a good idea to leave them as long as possible, to allow their skins to harden naturally. This will help them to last longer in storage. 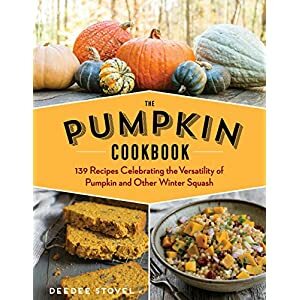 The Pumpkin Cookbook, 2nd Edition: 139 Recipes Celebrating the Versatility of Pumpkin and Other Winter Squash If you are planning to save the seeds, this extra time will also allow the seeds to get larger and more mature. The exception to this rule is harvesting pumpkins in very hot, dry weather. In these conditions the pumpkins will ripen much earlier and won’t last if you leave them too long. Once you are ready to harvest your pumpkins, make sure you cut them off the vine with a knife or pruning shears (also known as secateurs). Make the cut leaving at least 2 inches of stem. Don’t store any pumpkins with no stems or damaged stems as the rot will get in. Don’t lift the pumpkin by the stem either, but hold it gently from below. Be careful not to bruise the skin, so place pumpkins gently where you are planning to store them, and don’t handle them too much. Of course, not all pumpkins are orange, so the color darkening from yellow to orange is not going to give you a clue in these cases. A good tip, is to check the hardness of the skin before harvesting pumpkins. If you can’t pierce them with your fingernail, then the pumpkins are mature enough to store. Of course, if you’re not going to store the pumpkins, then you can harvest them much earlier. White pumpkins need to be harvested while they are streaked with green. Left too long they will take on a yellow tinge. They may also turn yellow if they are diseased or stressed by lack of water or nutrients. In some cooler climates, pumpkins won’t be mature by the time the first frosts come. Some will continue to ripen after they are harvested, but they won’t store so well, as their skins will not have hardened on the vine. After harvesting pumpkins, check them over carefully. 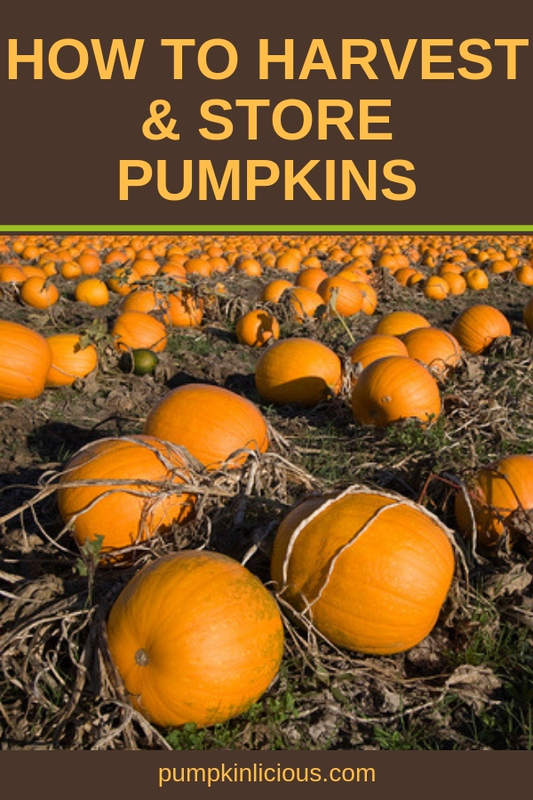 Only store those pumpkins which are in good condition, and have an intact stem. Otherwise rot will get in. You need a cool, dry place, but not too dry. The humidity has to be just right. Too damp and the pumpkins will rot, too dry and they will shrivel. The ideal humidity is about 55 percent. The temperature should be around the 50F or 10C range for best results. An unheated attic or dry basement might the best place if you’ve got one. 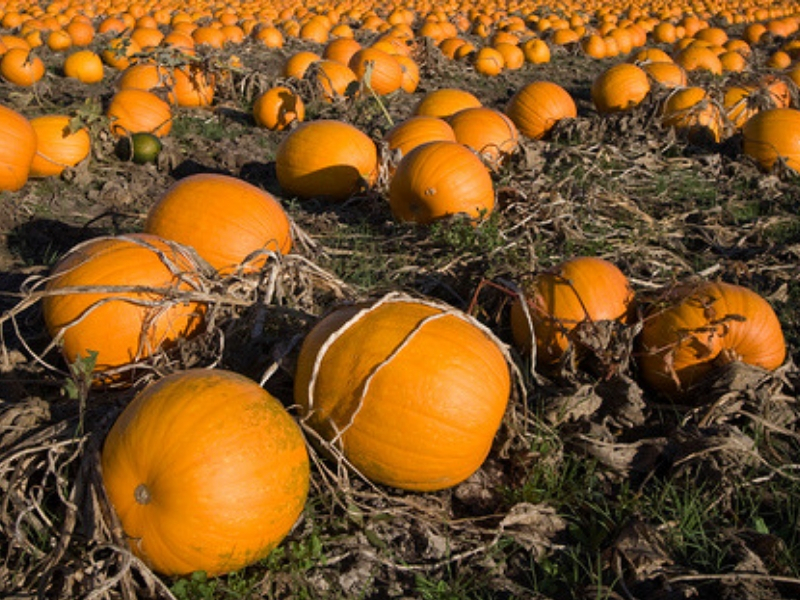 Store the pumpkins in one single layer, not touching on bales of hay, or a slatted shelf. They need to have air circulating around them. 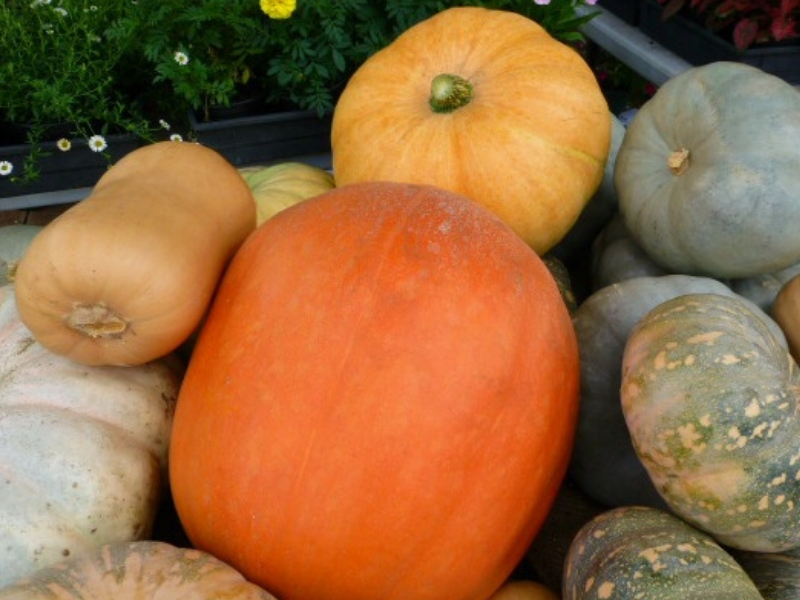 You should be able to store pumpkins for up to 8 months if the conditions are right. Keep an eye on them, wipe off any mold with a dry cloth, and take out any that start to show signs of rotting. You can also store a whole pumpkin in the fridge for about 4 months, if you’ve got the space. Pumpkins freeze well, either raw or cooked. Cut into 1 inch cubes, place on a baking tray and freeze. Once frozen, place into air-tight containers or plastic bags. Frozen raw, the pumpkin won’t keep very long, so use as soon as possible. If you want to keep it longer, it’s best to cook it first. Any oven cooked, steamed or boiled pumpkin can be frozen. Mash it into a puree, and store in convenient sized portions in plastic containers. This puree will last a year in the freezer. Learn more about cooking pumpkin here. Pumpkins can be canned or dried and will then last indefinitely. Canning needs to be done with a pressure canner to be safe. Dried pumpkin can also be made into flour. You could also make chutneys or sauces with any surplus fruits. For further details of these methods and lots of other ideas for growing and using pumpkins, I suggest Gail Damerow’s book The Perfect Pumpkin. Follow these simple steps to harvest your pumpkins and you’ll make the most out of your pumpkin crop to use for later!